Game recap April 4: Is Facebook cool again? I created my Facebook account in 2010, when it was the place where all the cool kids were; I could log in and see what all my friends were up to and what pages they were “becoming a fan” of and what their status updates were. Kids and adolescents could legitimately spend hours a day on Facebook getting lost in the concept of social media and being able to follow each other’s lives at all times. These days, I scroll through Facebook about once a day — sometimes a result of just clicking on the app by accident — and still spend a few minutes to scroll through my news feed and see some dumb dog videos or how much more successful my high school classmates are than me. It’s a place where relatives whom I’ve never met can wish me a happy birthday once a year and where my dad can share Van Halen music videos from the ’80s. I also recently helped my 80-year-old grandfather sign up for Facebook, so that he can connect with his relatives, who are also on Facebook. As for the game itself, the game was delayed by 90 minutes because winter is forever and the sun no longer exists. But once the game started, the Mets gave all the young whippersnappers streaming the game a treat by knocking off the Phillies by a score of 4-2. Noah Syndergaard got the start for the Mets and had an uneven outing, striking out seven, but racking up 92 pitches in just four innings while giving up two runs on four hits and two walks. He worked deep counts, struggled with his command, and seemingly couldn’t put hitters away after the second inning. To be fair to Thor, though, the second run scored off him was hardly his fault. The Mets infield was caught napping in the third inning, when Rhys Hoskins broke for second trying to steal, and Kevin Plawecki’s throw had him beat, but Hoskins got into a rundown. The Mets’ infield forgot about Carlos Santana at third base, though, who broke for the plate and scored before the throw came in. But hey, when two speed demons like Carlos Santana and Rhys Hoskins are on the basepaths at the same time, sometimes you just tip your cap, you know? Syndergaard was bailed out by his teammates, though. In the first inning, Yoenis Cespedes tagged a two-run dinger to left field that John Kruk on the broadcast described as “almost taking out a family of four.” The game was tied at two in the sixth, when Amed Rosario stepped in with two on and two out, and punched a first-pitch breaking ball over the head of right fielder Nick Williams, who was playing extremely shallow for some reason. 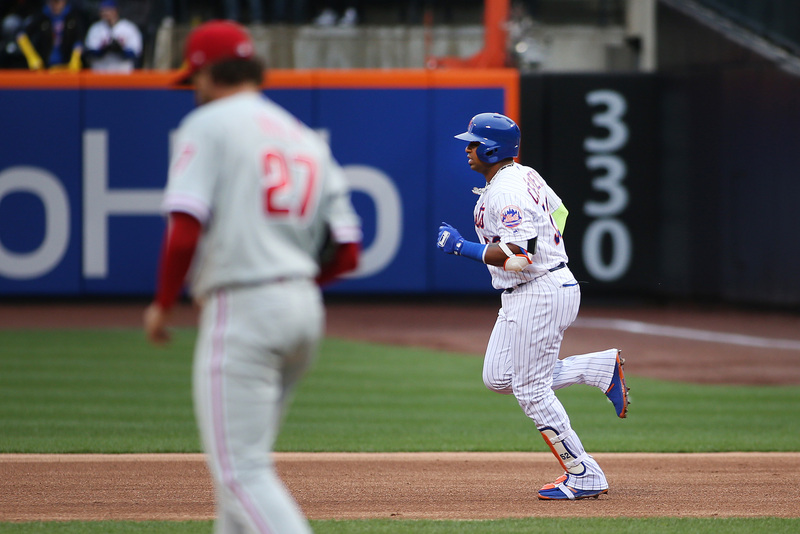 Both runners scored on the triple by Rosario to give the Mets a 4-2 lead. So, holding a 4-2 lead after Robert Gsellman pitched another solid two inning out of the bullpen, who better for Mickey Callaway to bring on in the seventh than high-leverage reliever *checks notes* Hansel Robles. Robles has looked lost on the mound for over a year, and this is the kind of game he’s had a tendency to blow in the past. This seemed like a doomsday scenario. But Robles struck out the side on 14 pitches, sending the Mets fans in the Facebook chat into a frenzy, as Scott Braun was so keen to point out for us a number of times. A.J. Ramos came on in the eighth and piched a clean frame, and Familia allowed a baserunner in the ninth, but did not allow him to score, as he notched his second save of the 2018 season. The Mets are now 4-1 on the season; the most games over .500 they’ve been since they were 7-4 early last season. Prepare yourselves: Michael Conforto is coming. Conforto is on his way to the nation’s capital, and Mickey Callaway said yesterday that it’s likely Conforto is activated from the disabled list today, his first day eligible. The Mets begin their season series with the Nationals today, at 1:10 p.m. down in D.C. for the Nats’ home opener. Jacob deGrom takes on Stephen Strasburg in what is always an important series for both teams, even at this stage of the season.